The Life of the Top one per cent. Three private jets landed at Washington DC in November 2009. Out stepped expensively dressed and healthily tanned men, carrying an air of authority and power. Visiting royalty? Foreign heads of state? No, simply the CEOs of three of America's biggest companies coming to beg for taxpayers' money to save their companies from bankruptcy. Their plight a result of a vile foreign plot? No, simply that they had not read the US auto market right. "There is a delicious irony in seeing private luxury jets flying into Washington, D.C., and people coming off of them with tin cups in their hand, saying that they're going to be trimming down and streamlining their businesses," Rep. Gary Ackerman, D-New York, told the chief executive officers of Ford, Chrysler and General Motors at a Congressional hearing. There is a class of people, relatively small in number, which exercises such massive power that they can negate democracy, buy and bully politicians, pay themselves what ever they like and cause mass destruction to the lives others outside their magic kingdom. These people are of course top bankers and directors of some of the biggest corporations. They live in a closed world, mainly mix with their own kind, and have developed a view of the world centered on their own egos. They and their organisations have risen to such power that they dominate the world economy impervious to the needs of the populace at large. Britain is particularly subject to these super-beings and the banks and big corporations that they lead. The UK economy is on its knees, mainly as a result of wild speculation by investment banks - yet bankers still award themselves huge bonuses. And the whole establishment - politicians, churches, and the mainly right wing media - are unable or unwilling to lift a finger to stop the farrago. At the end of October 2011, a report indicates that the total compensation of executives in the top UK companies (FTSE 100) increased by 49% for the year. Sir Martin Sorrell, boss of a huge advertising company, vigorously defended the increases, arguing that they were worth it because of the great value they created and that they had to keep up with the "market". Another commentator from the High Pay Unit commented that Sir Martin's comments indicated that he and his colleagues lived in a different world to the rest of the workforce, surrounded by privilege and cut off from the lives of their employees. The UK situation is mirrored by that of the United States, where top executive pay has soared over the last 20 years, whilst the pay of the workforce in general has hardly increased in real terms for years. In both countries, employees in both private and public sectors are facing pay cuts and increasing job insecurity. We quite rightly hear outrage at the ways in which top bankers reward themselves, most recently using public bailout money to lend to governments whose finances were ruined by the banks in the first place - and then paying themselves huge bonuses for doing so. But bankers are obviously not alone - it appears that top executives of big publicly quoted companies are a sort of mirror image of the investment banks, both being part of a tiny minority who live in wealth paradise whilst consigning others to employment hell. So, what about top corporate executives? How are they paid? How does their pay relate to performance? Are they so valuable that they merit their riches? What sort of world do they inhabit? Here are some views and data that might cast some light on the world of top CEO's. The data are from the UK FTSE100, up to 2007, but there is hard evidence that matters have since then become even more extreme in that top pay has roared ahead whilst economies crumble and the wider population suffer decreasing real pay and withdrawal of retirement rights. And..... In the UK, most big companies are failing to invest for the future and are susceptible at any moment to takeover - from which top executives also benefit. It's big-time win-win for a few. Are these people worth it? Professor Rakesh Khurana of Harvard Business School wrote an article in the Harvard Business Review based on his research into the phenomenon of "Superstar" leaders. He found that at the very least the legends about them were overstated, and often that they created great damage. * He also commented on a popular culture that lionizes super-individuals and ignores the fact that most great achievements are the result of collective efforts. In Britain, popular programmes that characterise business leaders as unpleasant and brutal add to the myths about super-heroes and a damaging cult of individualism that are commonly bandied about in the media. Everything we know about leadership points to the mindless fallacies of popular belief. Khurana quotes estimates that attribute about 40% of corporate performance to industry effects and up to 20% to year-to-year economic changes. The rest of corporate performance is mainly due to the efforts of many people, not just "The One". But he misses the point that superstars can cause huge damage almost by themselves. They can bring about corporate collapse through senseless acquisitions and stupid strategies. This note is compiled from several (private!) discussions with an actual CEO of a FTSE 100 company..
"The trouble with being treated like old fashioned royalty and cut off from the world inside your organisation is that you are developing a strong sense of entitlement and with it a false impression of your own importance. The really difficult thing is that your points of reference are now others like you and a media circus that behaves as though you actually are the company. This sense of self-importance can only be exacerbated by the trappings of power and position - chauffeured cars, corporate jets, an office suite containing many assistants, publicity advisers and bag-carriers encouraging a lifestyle that cuts you off from the lives of the average mortals that make up your fellow employees and customers. "Of course the reality is that you are very important, because you can cause great damage in conjunction with compliant external directors, a few corporate staff, and external advisers. You, without any reference to the many thousands of people who do the real business of this firm, can buy and sell assets and people and cut huge deals that will more likely than not damage the real company and with it many peoples' lives. You can also issue edicts and initiate programmes from your office that may change the lives of thousands of people without actually meeting any of them. Alas, you are unlikely to realise any of these things. Perforce, you have joined another universe, the centre of which lies outside the company in the world of your peers and competitors, the media and the City. Of this trinity, the City is the most powerful, because they can destroy you - and it is not in their interests that you should value the company, its customers and its people more than them. Some people might envy or hate you, but I feel rather sorry, because deep down you know that you cannot commit yourself to the people you lead- and you are rather frightened of the financial markets and the media. Too much concern with powerful external forces creates the gnawing worry that it could all end in failure. Personally, I wouldn't want your life for all the tea in China. It is actually quite rational to want as much as you can get out of it, quickly, because it may all come to an end soon. A corrosive combination of great power, great insecurity and great pressure is working its insidious influence on you and we are all the worse for it". Against a background of successful adoption of the various UK Codes of Corporate Governance, aimed at reining in corporate excesses, it is important to examine what has actually happened as a result. The data presented have come from a number of sources, in particular research by the Manchester University-based Centre for Research on Socio-Cultural Change. CRESC is funded by the widely respected Economic and Social Research Council. TOTAL REAL CHANGE IN HIGHEST PAID UK DIRECTORS' (ALMOST INVARIABLY CEO) PAY. 2. From 2002 to 2007, they include the growing impact on total pay of Long Term Incentive Plans. Thus the amounts by which pay exceeds performance are considerably greater than shown - in recent years by probably 25 - 40%. 3. The considerable value of pension and other benefits are excluded, so the total amounts are even larger than these data indicate. The Graph below contrasts relatively modest 24-year annual percentage increases in sales and pre-tax profit with much larger enhancements in dividends and directors' pay. 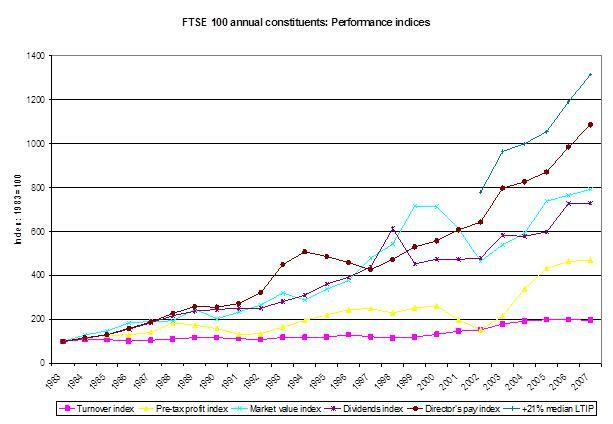 FTSE constituents are every company that has passed through the FTSE 100 since 1983. Their data have been analysed for the time that they were included in the Index. FTSE survivors are the company that have been continuously in the FTSE 100 from 1983 to 2007. This number is very small; less than 20 companies. Thus the attrition rate in the FTSE is very high, with 80%+ of companies disappearing from the Index. The reasons are usually mergers, failures, break-ups and foreign acquisitions. There is strong evidence that British-owned companies are less productive and invest less than most foreign counterparts, even in the UK. The most productive companies in Britain and the highest investors are subsidiaries of foreign-owned multi-nationals, followed by UK multi-nationals in Britain. Last come UK indigenous companies. At the aggregate level, there is little evidence of any linkages between directors' pay and corporate performance, although there is a tiny number of individual examples - Glaxo from 1983 to 2002 did show a positive linkage, (although its performance/reward relationship has deteriorated since then). The differentials between the pay of the average employee and directors have widened dramatically over the period, and if anything accelerated since the adoption of the Greenbury Code on directors' pay. A significant large part of the 'performance-related' element of directors' pay has come, not from underlying company performance improvement, but from non-profit related increases in dividend distributions to investors and general increases in share prices. Other main drivers seem to be company size and "the market for executive talent". FTSE 100 companies have shown consistently high increases in dividend distribution to investors and reductions in retained earnings. These effects have not occurred to the same degree in other developed countries. What effects has this had on investment and indirectly on performance? Much of the UK technology sector has been purchased by foreign competitors. The R&D spend of foreign-owned companies in Britain also declined by 3% in 2004. So foreign-owned companies are not bridging the gap caused by generally decreasing R&D investment by UK companies. Dividends paid to investors by FTSE 100 companies in 2005 were 164% of R&D spend, as opposed to 46% in US S&P 500 companies and less than 20% in Germany, France and Japan. Capital expenditure in many British companies has trailed behind the levels of many foreign competitors. This is not just a trivial statistic, as research indicates that there are strong links between R&D, related capital spend, and added value of output, productivity and eventually profitability. The needs for R&D and capital expenditure are highest in advanced, physics, chemistry and knowledge-based industries (DTI, NIESR) . In 2002, foreign-owned manufacturing companies in Britain created 24% more gross added value per head than British counterparts and had 133% higher net capital expenditure - they also paid substantially higher wages (NIESR) . In 2002, 40% of UK's top exporting companies were foreign-owned and nearly 50% of Britain's gross exports came from foreign-owned companies. IF NOT PERFORMANCE, WHAT DRIVES PAY? There is a convincing body of research from many sources on both sides of the Atlantic indicating very little correlation between levels of executive pay and corporate performance. A study of all the research into the relationships between performance and pay by Tosi and others indicated that company size was the most important variable, with performance only influencing pay levels to about 5%. This is also borne out by UK research. The pay-size relationships are very interesting. It appears that the FTSE 100 is a sort of 'club' that almost guarantees its CEOs very significantly higher levels of compensation than those of smaller quoted companies. The table below contrast total pay of the CEOs of quoted companies of various sizes. It highlights the massive differences that size makes to pay, particularly between companies outside the FTSE 100 and those within. It also examines the relationships between base and total pay, highlighting the increases in variable pay percentages with increases in company size. This table illustrates vividly how the FTSE 100 acts as a kind of club, virtually guaranteeing high rewards to members. There is little difference in the ratios of pay to company size within the FTSE 100 - as opposed to previously demonstrated massive differences between FTSE 100 and smaller quoted companies. Sources: ESRC, CRESC, DTI, NIESR, CIPD.